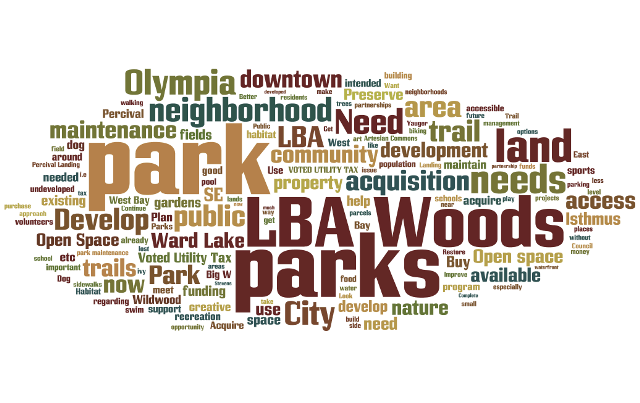 This graphic, a word cloud, created by Olympia Parks’ staff, shows the top 150 words heard at the public neighborhood meetings in 2014-15. The more often a word was used, the larger it appears in this word cloud. It was LBA Woods big and bold, loud and clear. The LBA Woods from above, looking from southwest and Boulevard Rd. 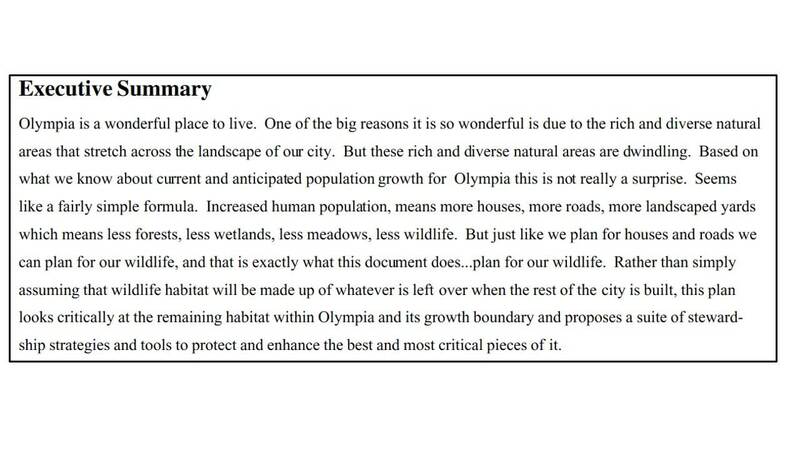 A Win for Our Environment Since 1994, Olympia has lost 30% of its natural habitat. 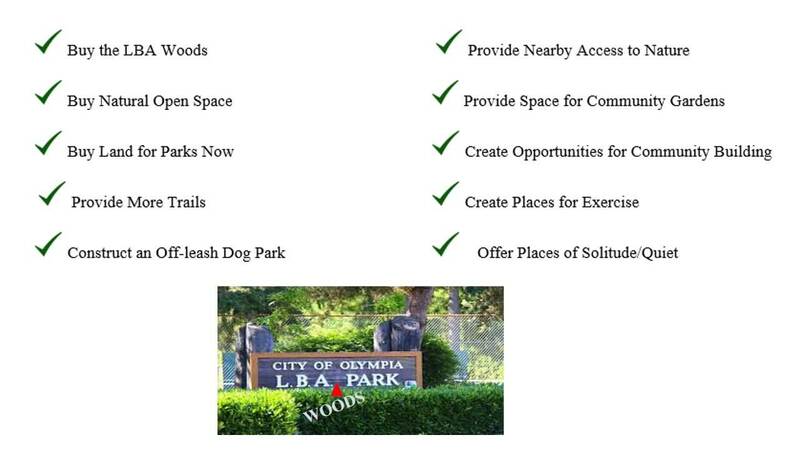 The City of Olympia’s Comprehensive Plan, adopted in December of 2014, sets goals and policies for wise management of our natural environment for the next 20 years. This plan identified a portion of the LBA Woods as an important open-space corridor that should be given special consideration. 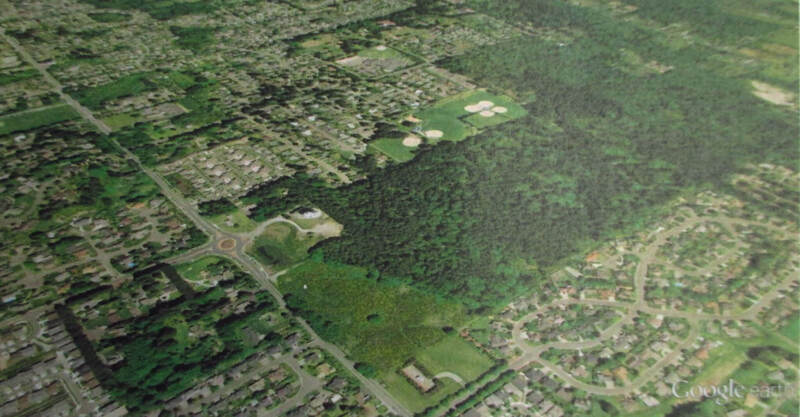 Additionally, the City’s preliminary Habitat and Stewardship Strategy, published in 2013, stated unequivocally the need to protect and enhance critical wildlife habitat within Olympia and its growth boundary: Saving the LBA Woods from housing developments helped protect one of the city’s largest blocks of remaining wildlife habitat. The 150 acres of dense woodlands and native understory provide homes to large and small mammals such as coyote, deer, porcupine, mountain beaver, possum, raccoon, voles, and skunk as well as amphibians, insects, and birds. LBA Woods provides important habitat to at least 55 bird species, many considered by the National Audubon Society as at risk from the impacts of climate change. The LBA Woods helps protect the nearby Chambers Creek Basin, a fragile watershed which provides important spawning habitat for coho salmon. The LBA Woods Park Coalition submitted public comments on the threats to the Chambers Creek Basin posed by stormwater runoff and hydrological changes from the proposed Ashton Woods/Trillium housing development. Groundwater concerns are highlighted in this Memorandum Report (August 6, 2015) by a licensed hydrogeologist. 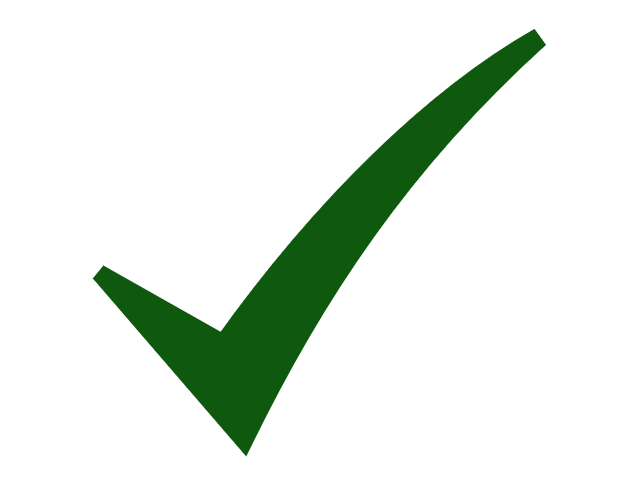 A Win for Our Community Connections to nature are important for our personal well-being and the health of our community. Olympians need natural places to relax, recreate, and socialize—especially as our city grows in population and our natural environment is replaced by a built environment. The National Recreation and Park Association’s synopsis of recent research documents how parks help create vibrant communities through a fascinating and complex suite of physical, mental health, social functioning, youth development, environmental, and economic benefits. Recent medical studies show that larger forest tracts provide special health benefits to users, including immune system boost, lower blood pressure, reduced stress, accelerated recovery from surgery or illness, increased energy level, and improved sleep. Children who spend time in nature have higher ratings of perceived self-worth and decreased symptoms of depression, anxiety, ADHD, anger, and conduct disorders. Our current Olympia park system includes 963 acres of parkland classified into three park types: Neighborhood, Community, and Open Space. Neighborhood Parks are usually small or “pocket” parks with amenities such as playground equipment, basketball court, and picnic tables. Examples include Harry Fains Park, Decatur Woods, Lions Park, and Sunrise Park. Community Parks are larger parks with athletic field complexes or special features. Examples include Yauger Park, Steven’s Field, Yashiro Japanese Gardens, and current LBA Park. Open Space Parks feature undeveloped land and the natural features of the landscape. Open Space Parks–Watershed Park, Priest Point Park, and Grass Lake Park—offer passive recreational opportunities such as hiking, bird-watching, and beachcombing.